To Cite: Rashidi S, Sadraei J, Fruzandeh Moghadam M, Pirestani M. Isolation and Molecular Characterization of Toxoplasma Gondii Strains From Rats in Tehran, Jundishapur J Microbiol. 1970 ; 5(4):537-541. doi: 10.5812/jjm.2852. Background: Toxoplasma gondii is a unicellular apicomplex organism, belonging to the Toxoplasma genus. The parasite infects humans, as well as mammalians and different species of birds, and it can be propagated in a wide range of host cells. There have been no appropriate molecular or serological studies carried out previously in Iran on the prevalence of Toxoplasma gondii in rodents. Objectives: Therefore, the present study has been carried out to provide genetic identification and determination of wild rats in Tehran, Iran. Materials and Methods: Forty rats in Tehran were caught with traps. Subsequently, their brains were removed under sterile conditions, DNA extraction was performed with a phenol and chloroform method. In the current study, a repetitive sequence in the genome T. gondii was used for identification with a specific primer. By sequencing the purified Polymerase Chain Reaction product, seven strains were determined out of the positive samples. Results: Of the forty samples, 20 samples (50%) were positive for the 529-bp band. Samples No. 21 and No. 28 had 95% and 92% similarity with the RH strain sequence, respectively, which had the highest identity rate. The identity rate for samples No. 16 and No. 28 was 82% and 81%, respectively, which had the lowest rate of identification. Conclusions: The contamination rate was determined to be 50% using the PCR method. It can be stated that rats play an important role in the preservation of the Toxoplasma life cycle in Tehran. According to the alignment of results obtained from the seven sequenced samples, the highest similarity was observed with the RH strain (81-95%). Copyright © 1970, Ahvaz Jundishapur University of Medical Sciences. This is an open-access article distributed under the terms of the Creative Commons Attribution-NonCommercial 4.0 International License (http://creativecommons.org/licenses/by-nc/4.0/) which permits copy and redistribute the material just in noncommercial usages, provided the original work is properly cited. Toxoplasma gondii is a unicellular apicomplex organism, belonging to the Toxoplasma genus. Contamination with the parasite has been reported all over the world (1-3). This unicellular parasite was first isolated by Nicole and Manceaux in 1908, from a type of rodent called a Ctenodactylus gundi in the Pasteur Institute, Tunisia (4, 5). Simultaneously, Splendor, an English researcher, isolated the parasite from a laboratory rabbit (6). The parasite infects humans, as well as mammalians and different species of birds, and it can be propagated in a wide range of host cells (7). One of the most frequent parasitic infections of humans and other warm-blooded animals is contamination with T. gondii. It is estimated that 5 × 108 of individuals all over the world are affected by the parasite (8, 9). Although acquired toxoplasmosis in individuals with normal immunity usually causes only a mild disease or even remain asymptomatic, it may lead to severe symptoms and complications or even death in individuals with immune system disorders (10). In patients with AIDS, almost 30% of deaths are due to toxoplasmosis, and one of the causes of mortality in such patients is toxoplasmosis encephalitis (7-11). Congenital toxoplasmosis occurs when the mother is affected by the disease during pregnancy or if she has an immune system dysfunction. In such cases, transplacental transmission of the parasite to the fetus leads to severe complications (11, 12). Using serological tests, it has been demonstrated that the prevalence of toxoplasmosis in Iran varies in different regions. Studies have shown that the rate of contamination in individuals with the parasite is; 55% for the people living along the Caspian Sea coast, 23% in the West Azerbaijan province (west of Iran), 6 and 9% in Izeh and Sar Dasht (south of Iran), respectively, 29% in the Fars province (central part of Iran), and 39.6% in Kazerun town (south of Iran) (13). According to investigations carried out by the Pasteur Institute, Iran, almost 33% of the affected individuals were under 10, and females comprised 56% of the affected individuals (14). Moreover, it was reported that 75.2%, 47.5%, 41%, and 72.96% of pregnant women in Amol (north of Iran), Zanjan (west of Iran), Qom province (central part of Iran), and Tabriz (west of Iran) were positive for the IgG antibody against T. gondii, respectively (15-18). A study of stray cats in Tehran showed that 89.2% of them had anti-toxoplasmosis antibodies (19), whereas anti-T. gondii antibodies were found in 54% of cats in Ahvaz (20). A serological evaluation of rats in Tehran, which was carried out concurrently with the current study, showed that 36.7% of the rats in Tehran were contaminated with Toxoplasma (21). Many wild rats live in Tehran; moreover these may play an important role as reservoirs and intermediate hosts of the parasite. Therefore, considering these points and also the state of Toxoplasma infections in Iran, the current study was carried out. For this study, 40 wild rats were collected from the north, south, east, and west of Tehran using traps. The rats were anesthetized with ether and then killed. Their brains were extracted under sterile conditions, and were put into a container full of sterile physiological serum. The DNA of the samples was extracted using a phenol and chloroform method (26). We used a 529-bp repetitive sequence in the T. gondii genome (accession number 146527). The segment does not encode any protein, and repeats in the Toxoplasma genome 200-300 times. Thus, it has good sensitivity and specificity for the identification of the parasite. The sequences of the primers were as follows (27): SDKF (´3-TTAGGTCTACGTGACACAGACGTC-´5)SDKR (´5-CTGCAGACACAGTGCATCTGGATT-´3) PCR step for a total of 30 cycles, each consisting of 95° C for 45 s, 55° C for 30 s and 72° C for 45 s were performed. An initial incubation at 95° C for three minutes, a final extension at 72° C for 10 minutes and final soak at 4° C was included. PCR products were directly sequenced by GenFanAvaran Co. The resulting sequences were completed and aligned using the programs; ChromasPro Version 1.32 (Technelysium Pty. Ltd., Qld, Australia) and ClustalW (http://www.ebi.ac.uk/Tools/msa/clustalw2/) and compared with reference sequences from GenBank. Out of the 40 samples, 20 samples (50%) were positive for the 529-bp band (specific for Toxoplasma) Figure. Furthermore, in Table 1, the characteristics of the positive and negative samples are provided. The sequences of the isolates from the present study are accessible under GenBank accession nos. HM569597-603. By carrying out a PCR process on all samples, it was demonstrated that the brains of 50% of wild rats in Tehran are contaminated with Toxoplasma. The sequences of the seven samples were aligned with the data available in the GenBank, using available software. The results were obtained for each sample. Then, the nucleotide sequences of the seven samples were compared with each other, and the results were obtained. The nucleotides marked with a star were those that were identical in all samples. According to the alignment results obtained for the seven sequenced samples, the highest similarity was observed with the RH strain (81-95%). Table 1 Results of Toxoplasma Infection in the Brains of Wild Rats by PCR. Toxoplasma gondii is a unicellular parasite, and it infects all types of warm-blooded vertebrates, including almost one third of the human population. Since the discovery of the parasite, numerous studies have been carried out to identify its; biological characteristics, antigenic components, epidemiological aspects, identification of the isoenzyme and molecular pattern, as well as other aspects. The result of these invaluable attempts is that extensive information is currently available on the organism. However, research on these aspects as well as the Lesser known aspects of the organism is still in progress. In our study on the role of wild rats as a potential source of T. gondii, Toxoplasma was detected in 31 (50%) wild rat brain samples using the PCR method. With regard to the sequences, the highest similarity was observed with the RH strain, and the alignment results of the seven samples can be classified as follows: 1- Similarity with the RH strain was 95% and 92% for samples No. 21 (Mehrabad airport) and No. 18 (Darakeh), respectively. As can be observed, their sequences had the highest similarity with the sequence of the RH strain. It should be mentioned that the two samples were taken from two areas that are some distance from each other. 2- Samples No. 30 (Zafar) and 26 (Tehran Pars) had 87% similarity with the RH strain. The similarity rate was 86% for sample No. 23 (Javanmard-e Ghasab). These three samples were also geographically distant, but had almost the same rate of sequence similarity. 3- Similarity with the RH strain was 82% and 81% in samples No. 16 (Evin) and No. 28 (Sadeghieh). These two samples were also taken from geographically distant areas, but had almost the same rate of similarity. Most studies in Iran have been carried out on the epidemiological and diagnostic aspects of the parasite. We attempted to identify the contamination rate of wild rats in Tehran through genetic methods. In previous studies in Iran, the prevalence of the parasite in their hosts has been determined using serological tests, and the highest prevalence was reported for pet birds (51%). The study carried out by Zia Ali addressed the frequency of contamination in some hosts such as sheep and goats by the parasite, and the contamination rates were reported to be 22.8% and 14.3% for sheep and goats, respectively (25). In another study, Hashemi et al. determined the contamination rate of sheep and goats in the Qazvin, Kerman, and Azerbaijan provinces using the Latex method, and the rate was reported to be 24.3% and 20% for sheep and goats, respectively (28). In the studies carried out by Rahbari et al., using a direct agglutination test, the frequency of toxoplasmosis in sheep in the three areas of the Mazandaran province were determined to be 64.3%, 54.5%, and 49%. It seems that the test method was effective as evidenced by the high rate of contamination (29). Hoghughi et al. reported the frequency of toxoplasmosis in sheep and goats in the Khuzestan province to be 13.8% and 13.1%, respectively (30). In the study carried out by Ghorbani et al. on pet birds using the IHA method, the prevalence of toxoplasmosis was reported to be 20.5% and 30.3% in Tehran and Mazandaran, respectively (31). So far, no study has been carried out on toxoplasmosis in the brains of Iranian wild rats. Thus, we have selected wild rats for this study avoiding previously studied hosts. In most Iranian studies, serological methods have been employed, which are not as sensitive as molecular methods. Therefore, we used the PCR method in the current study. In other countries, many studies have been carried out on the prevalence of toxoplasma in various hosts. The contamination rate was reported to be 0.8% in a study carried out in Grenada, West Indies, on 308 rats. In another study in England, the prevalence rate of Toxoplasma contamination in rats was determined to be 35%, while in a similar study in the Philippines, the rate was reported to be 55.5% (22, 32, 33). According to our results, the contamination rate of Toxoplasma in the brains of wild rats in Tehran was determined to be 50% using the PCR method. In another study carried out on cats in Tehran, the rate was determined to be 89% (19). The rate obtained can be explained by the close relationship between cats and rats. Serological evaluation of rats for contamination by the parasite in a parallel study showed that 36.7% of rats in Tehran are contaminated with Toxoplasma (21). Considering the level of contamination of the cats by the parasite in Tehran and also the molecular and serological contamination rate of 50% and 36.7%, respectively, it can be stated that rats play an important role in the preservation of the Toxoplasma life cycle in Tehran. Considering the sequence of the isolates, the highest similarity was observed for the RH strain, which ranged from 81% to 95%. This study is of environmental and sanitary interest. It is important for public health because of the close relationship between cats and rats. Based on the relatively high occurrence of this parasite in rats in Tehran, we have to consider these animals to be a major risk factor for the transmission of T. gondii in this area. Herein, the kind cooperation of the research chancellor of the university and personnel of Department of Parasitology are highly appreciated. Implication for health policy/practice/research/medical education: The experiments revealed that the isolates can be used in pilot scale for industrial production of new biosurfactant/bioemulsifiers. Please cite this paper as: Kasra Kermanshahi R, Peymanfar Sh. 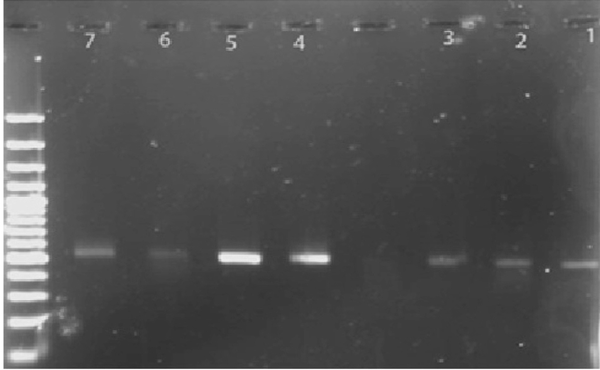 Isolation and Identification of Lactobacilli From Cheese, Yoghurt and Silage by 16S rDNA Gene and Study of Bacteriocin and Biosurfactant Production. Jundishapur J Microbiol. 2012;5(4): 528-32. 16. Rahnema B. [Prevalence of toxoplasmosis in pregnant women and non pregnant in the Tabriz]. Tehran: Tehran Medical Sciences University.